The Mövenpick Royal Lily flagship cruiser comprises 56 cabins of approximately 22 sq m and 4 magnificent Royal Suites. These come equipped with a Jacuzzi and spacious facilities, ensuring you travel in style. 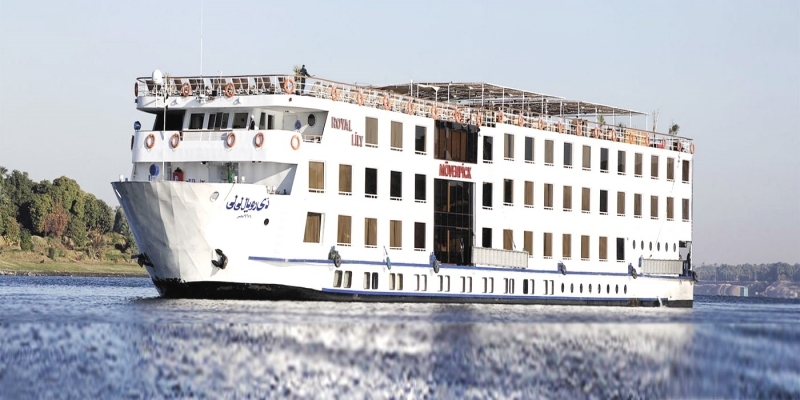 Cruises leave from either Luxor or Aswan. Deluxe Cabins with two twin beds are approximately 22 square meters. Tastefully and luxuriously furnished, the cabins have en-suite shower room, individually controlled air-conditioning, TV, minibar, climate control and telephones that enable international calls via GSM lines. The expansive restaurant located under the Main Deck offers guests three gourmet meals each day that satisfy your every desire by offering an extensive mix of different cuisines. Mouth-watering buffets feature authentic Egyptian cuisine and there is a tempting selection of international and vegetarian dishes accompanied by a selection of local and imported wines, spirits and liqueurs. The Salon Deck with panoramic windows offers a relaxing lounge serving afternoon tea and a semi-circular bar.